Ceramic tiles has become popular and have been widely used by home owners long time ago. Due to its unique characteristics of need easy care and maintenance as well as beautiful appearance. However, even though ceramic tile floor need less care and maintenance compare to the other kind of flooring materials, but you have to make sure that you make the correct way to keep the floor long lasting. So this article will give you some useful guideline and tips about how to take care your ceramic tile floor properly. According to the fact that we can not keep the floor away from dirty, and every flooring materials need extensive and accurate way of maintenance, and ceramic tile floors are no exception. However, there are some tips for you in order to reduce the cleaning job, which take a lot of time and energy to do. 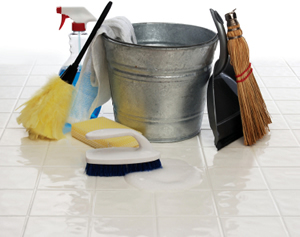 Probably you can reduce frequency of heavy cleaning jobs on your ceramic tile floor. Now the first tip of caring your ceramic tile floor is to adjust your behaviour to be conscious to notice any kind of stain that may stick on the floor more frequently and you have to clean it right away when you find them. This behaviour will help you to reduce effort and avoid difficulty to clean them when these stains dry on the floor. If you let that stains dry on the floor, they are not only become more difficult to clean but also they will attract far more dirt to the floor before you finally get it cleaned up. Fortunately that ceramic tile floor is probably only one material that allows you to be able to sweep and mop as many time as you want without worry about harming the tile surface, so it is a good opportunity to clean it often. Moreover, some kind of dirt is really hard to wipe out, for example, rubber and acrylics, if they dry on the floor, they can not be cleaned by water and mop, you need kind of special chemical liquid cleaner to clean them. So be vigilant about protecting the floor by sweeping and mopping regularly. The other good idea to prevent your ceramic tile floor from sticky dirt is to have a dirt-catching mat somewhere on the floor. Especially it will very effective if you put this mat in front of the door room so the mat will catching dirt off the bottom of people's shoes before they walk into the room. By having this mat, you will not believe that you can reduce time and effort on cleaning your ceramic tile floor. Also it would be better if you buy a mat that easy to clean, because you will have to clean these mats from time to time than it is to have to sweep and mop your whole ceramic tile floor more regularly. The mats also don't show dirt nearly as much as the floor will. OK, now let’s clean it when it need to be cleaned. However, when the time to do a major clean arrives, but before you start, it is very important to follow the instruction of ceramic floor manufacturer about what kind of cleaner and the type of cleaning chemical that can be used with your ceramic floor. There are several all-purpose cleaners on the market that claim to do a great job on ceramic tile floors, but just be sure that you test them out first before using them on the entire floor. As you can see that the ceramic tile floor is not a material that difficult to clean, but however, it needs the correct method of cleaning and if you apply tips mention above you will live with it happily.